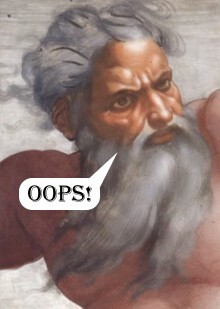 To clean up the shenanigans that occurred after God screwed things up in the Garden of Eden, the story says that God decided to wipe the Earth clean except for Noah, his wife, his sons, and their wives… and of course two (or seven) of every “kind” of animal (not counting sea animals). 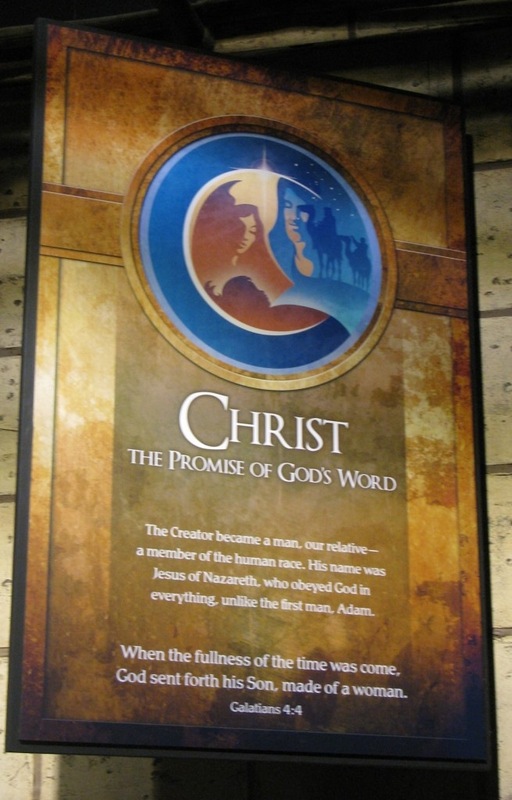 The Creation Museum has quite a bit about the ark and there’s a definite dividing line that separates the two main parts. The first part shows how the ark could have been created and has incredibly detailed dioramas of different stages of the ark’s progress. 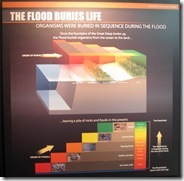 The second part contains all the tortured, pseudo-scientific rationale for the flood’s being real. The first part was fun (if unbelievable). The second part was painful. 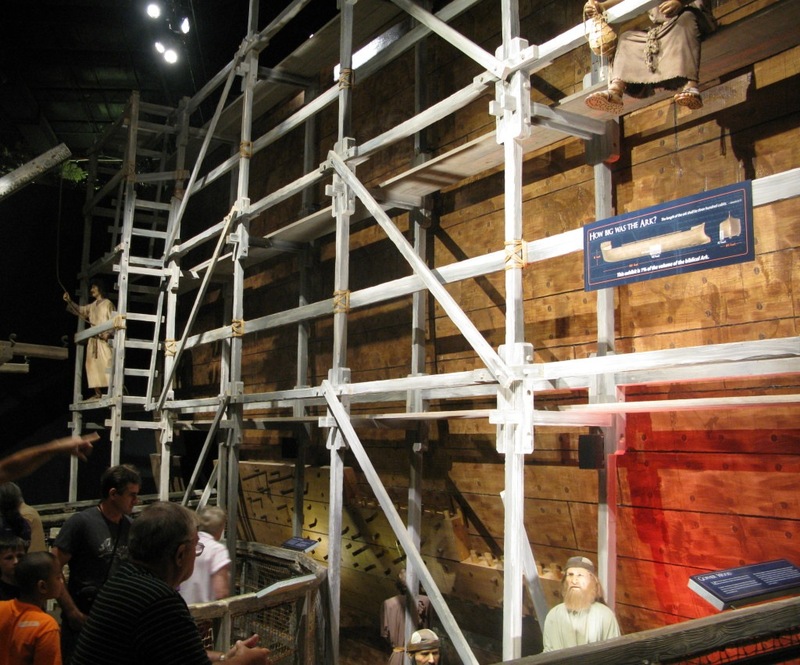 The room pictured above showed animatronic workers helping build the ark… and complaining about all the hard work. 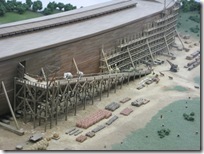 The plaque on the scaffolding explains that this section represents only about one percent of the size of the “actual” ark. 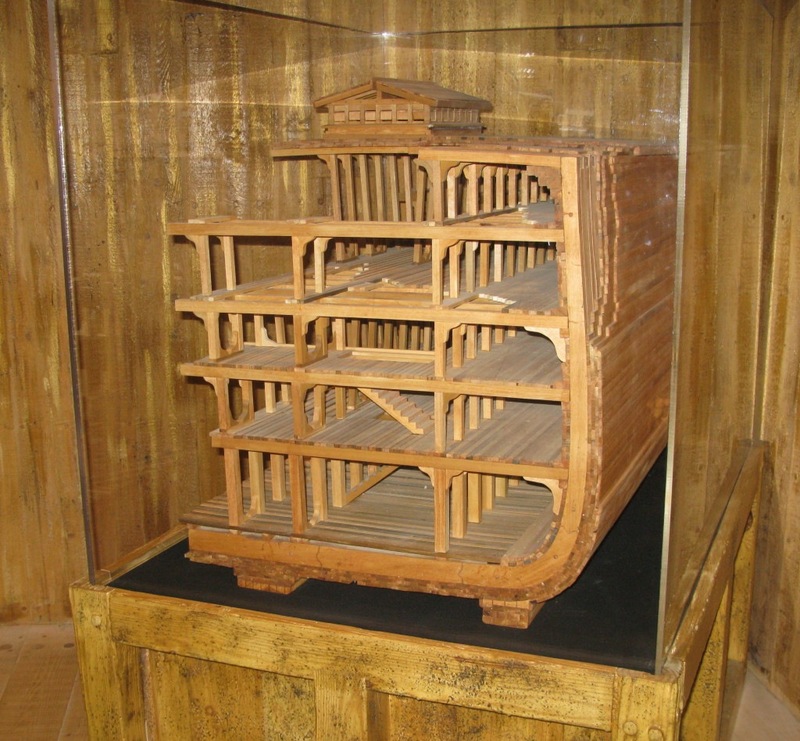 The design of the ark is explained in one of the Creation Museum videos and is definitely not the stereotypical “box” form that is frequently shown. 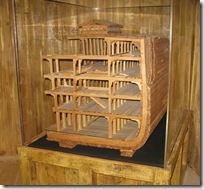 A smaller model shows another cross-sectioned segment of the ark, clearly showing multiple decks. 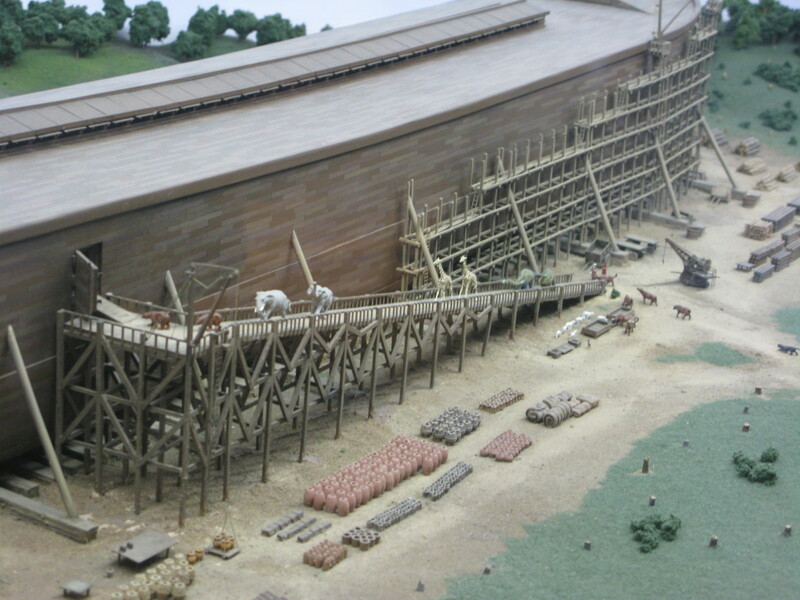 It’s actually a little bigger than what God commanded Noah to build, but it’s an impressive model nonetheless. Great pains are taken to explain how the ark could have been built large enough to hold all the animals, sturdy enough to withstand all the raging floodwaters, and technologically advanced enough that it wouldn’t fall apart or tip over after floating aimlessly on the water for about a year… even though it was built by folks who weren’t shipwrights. 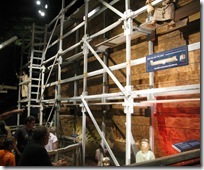 In the bible, God tells Noah to build the ark and about that, it only says, “And Noah did according unto all that the LORD commanded him.” The Creation Museum takes a few liberties with the details, since they’re not spelled out in the bible. The first plaque explains how, though it’s perfectly reasonable to think that Noah and his family built the ark by themselves (! ), because he lived righteously for centuries (! 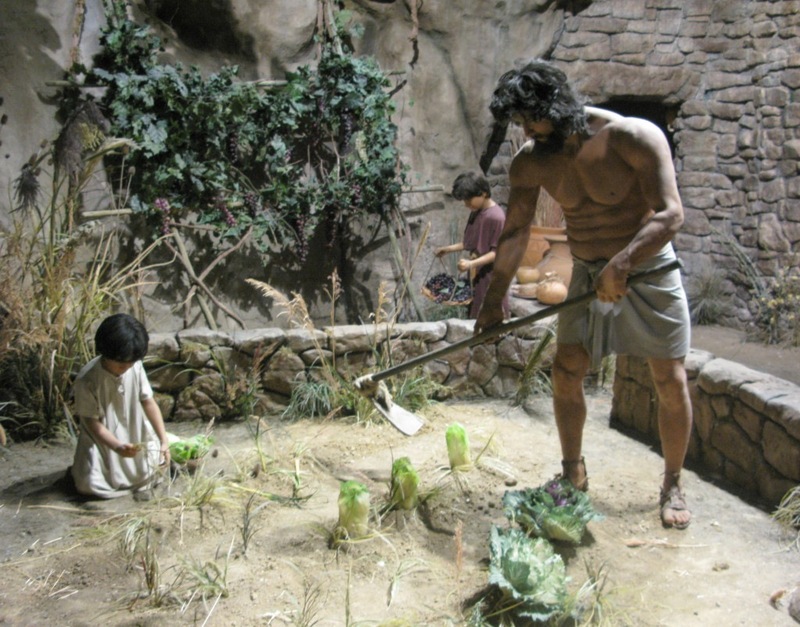 ), he may have been wealthy enough to hire shipbuilders… which evidently would have been cool, because then Noah could preach to them about the coming judgment (or so the plaque says). 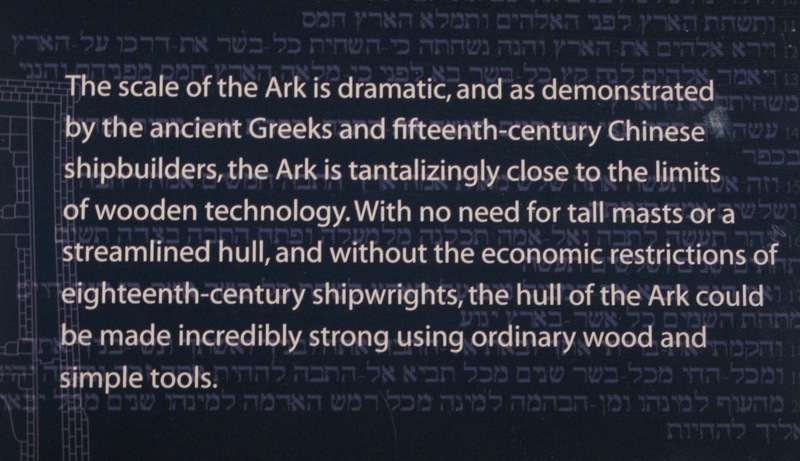 The second plaque says that, because the ark was built far inland (where there probably weren’t many shipbuilders) and was of such a massive scale, it “would likely have been known the world over.” Somehow, I tend to doubt that the Chinese folks knew of it. The ark dioramas were one of my favorite sections of the museum because they were spectacular. The ark in the first diorama was probably close to four feet long and the level of detail (in all of them) was just astounding. 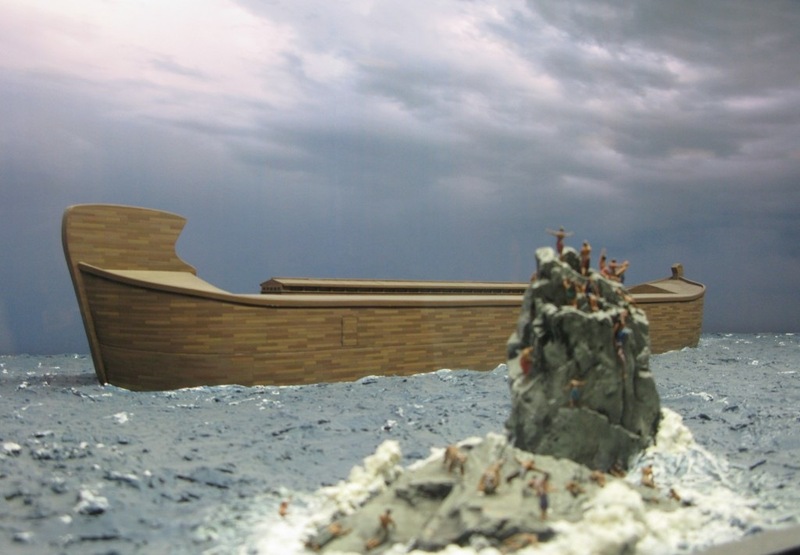 In fact, the Creation Museum DVD about the ark uses close-ups of these dioramas in their footage and it looks real… like full-sized real. It’s very impressive. If you look closely in the picture to the right, which is just a close-up of the loading ramp, you’ll notice something interesting following just behind the giraffes. Dinosaurs! The Creation Museum makes it very clear that Noah took dinosaurs onto the ark. They’re very clear that dinosaurs lived with humans. They’re very clear that they really have no concept whatsoever of science… or reality. They are, however, exquisite craftsmen who make awesome dioramas. 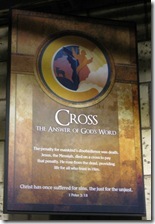 A plaque explains about the animals that were loaded onto the ark. 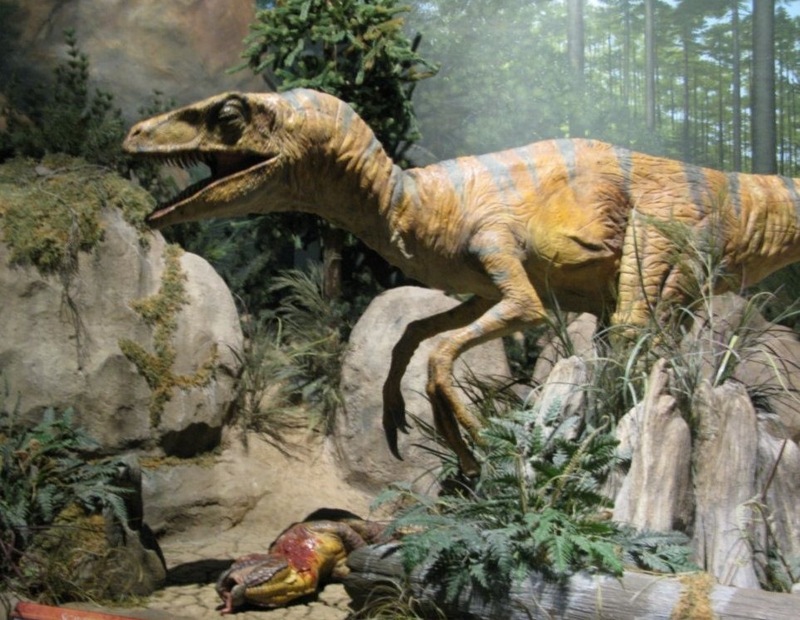 They included, of course, dinosaurs, but most of the animals were likely young adults because “Being smaller, they would also be easier to care for.” That would only apply briefly because, since the ark was to be afloat for about a year, most animals would have matured to full size during that time. That bit isn’t mentioned, though. 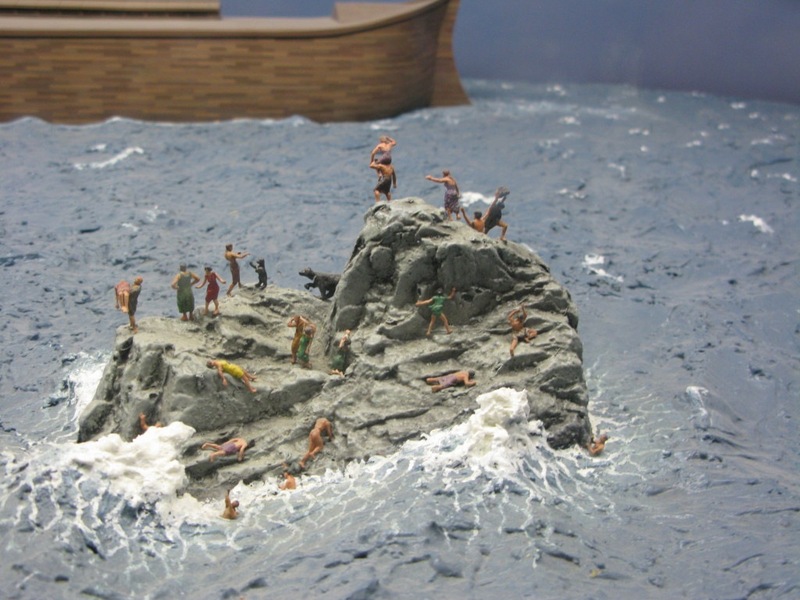 The next diorama showed the ark seaborne as the water rose higher and people were desperate to get on board. Again, the detail was extraordinary… and somewhat disturbing. In the third picture, you can see some competition going on for the top spot (the man holding the rock over his head) and another guy who looks like he’s become the target of a bear’s attention. After that, however, once all the sinners drowned, things must have gotten somewhat more peaceful. 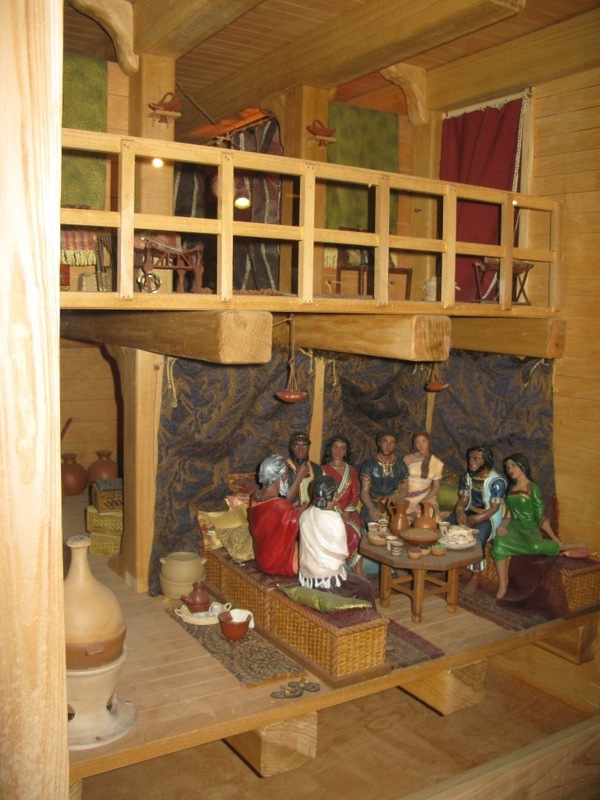 Noah and his family (a total of eight) got to hang out in the ark, seemingly in a bit of luxury with fine clothes and plenty of food. It must have been a pleasant cruise from the looks of it. Never mind that eight people had to care for (according to Answers in Genesis, the Creation Museum’s parent company) about 16,000 animals. Never mind that they had to deal with (again, according to AiG) about 12 tons of animal waste each day. Never mind that the ammonia from the rabbit urine alone would be enough to choke a rhino. The thing is, if you explain the whole ark story by claiming supernatural intervention by God, then there’s really no arguing (other than the whole “God” thing). 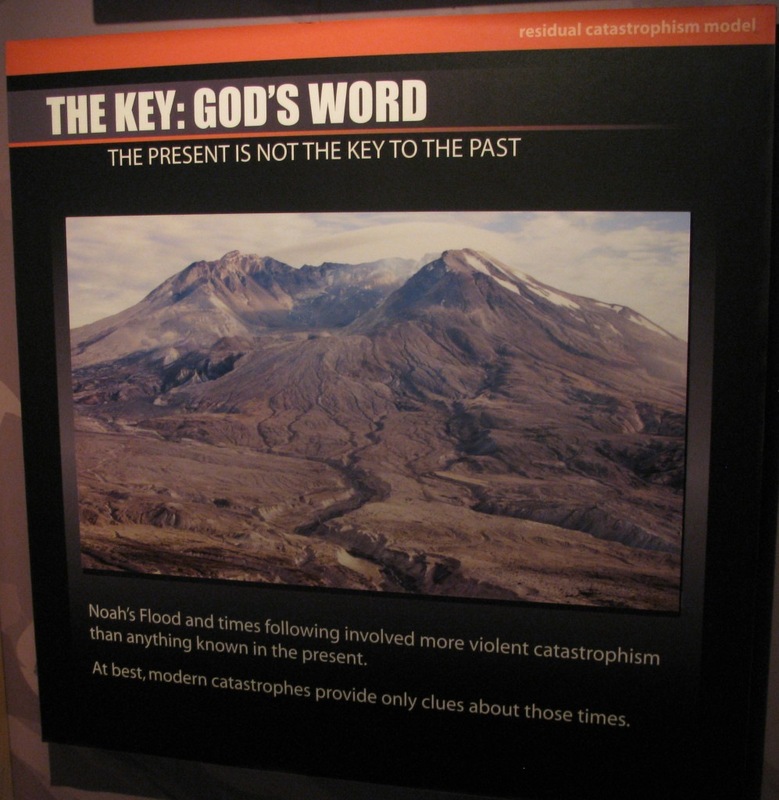 However, the Creation Museum doesn’t make that claim. While it is possible that God made miraculous provisions for the daily care of these animals, it is not necessary or required by Scripture to appeal to miracles. They try to show how it’s entirely possible that the flood story was literally true without any significant divine intervention. It’s an absurdist notion. 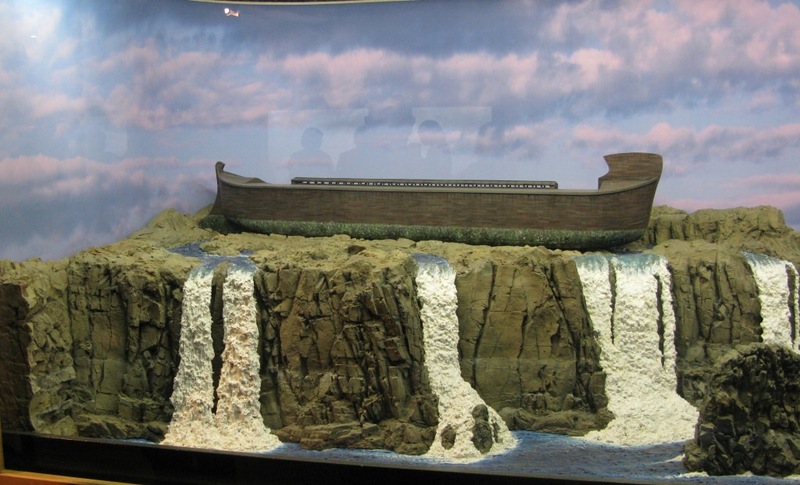 Finally, the ark came to rest and the floodwaters began to drain away to… somewhere. 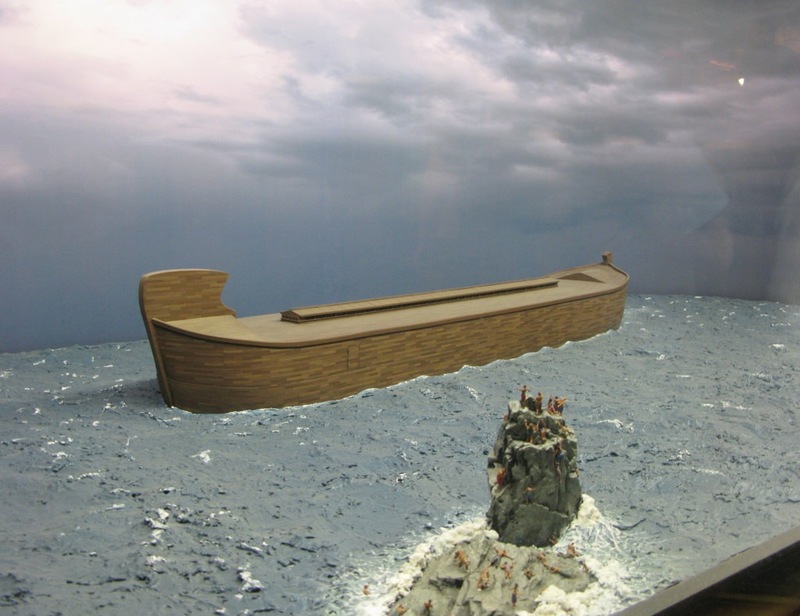 This was the final diorama in the ark room, showing the happy ending for Noah and his family. All they had to do from this point is to wait for things to dry out and then go repopulate the planet. Piece of cake. This is also the demarcation point I mentioned at the beginning. 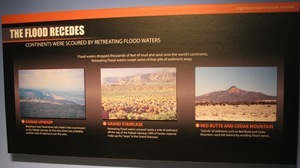 The museum was done with the story of the flood and now turned its focus to the aftereffects of the flood. This is where the pseudo-scientific hogwash really takes wing. Here’s the sign that sets the stage for what’s to come. The flood caused natural catastrophes like erosion and earthquakes… perhaps the greatest earthquake ever known (sorry… Land of the Lost grabbed hold of me there). 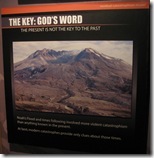 They make it clear again that God’s Word, not the past, is the key to everything. Then they go on, ad nauseum, with a vain and scientifically ludicrous attempt to prove their case. Starting with the laughable idea that the world’s continents changed from Rodinia to Pangea to their current form in about a year, they show case after case of scientific ignorance. Just for the record, Rodinia is thought to have existed 1,100 and 750 million years ago. Pangea is thought to have existed roughly 300 million years ago. 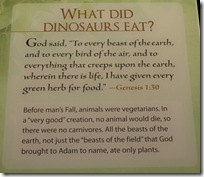 Not so for the Creation Museum. Their claim is that the global flood caused well over 500 million years of plate tectonic shift in about a year… and they’re just getting started. 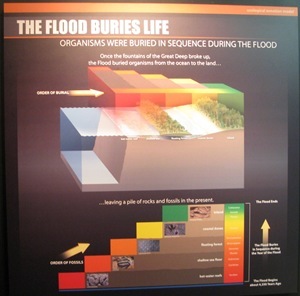 They try to show how receding floodwaters account for the different geological layers, the corresponding fossil layers, coal deposits, canyons, deserts, mountains, and various other geological features. They fail. After showing geological features, they make an attempt to explain how biological development took place. 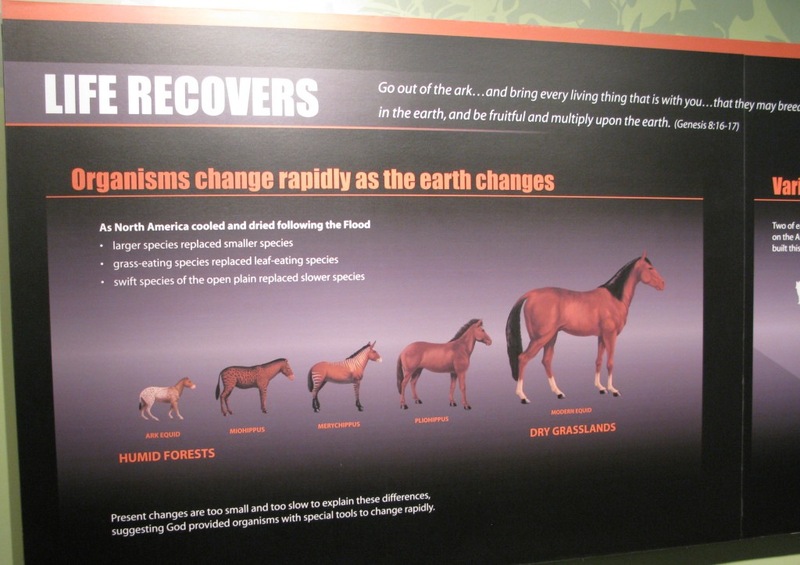 From the evolution of animals (within their “kind,” of course) to the distribution of the animals across all the continents of the world (since Rodinia and Pangea were broken up underwater into separate continents), the explanations are far-fetched at times and hysterically childish at others. Starting with the development of the horse, implying that the “horse” on the ark was just a little guy, it continues with a completely incomprehensible claim about marsupials. 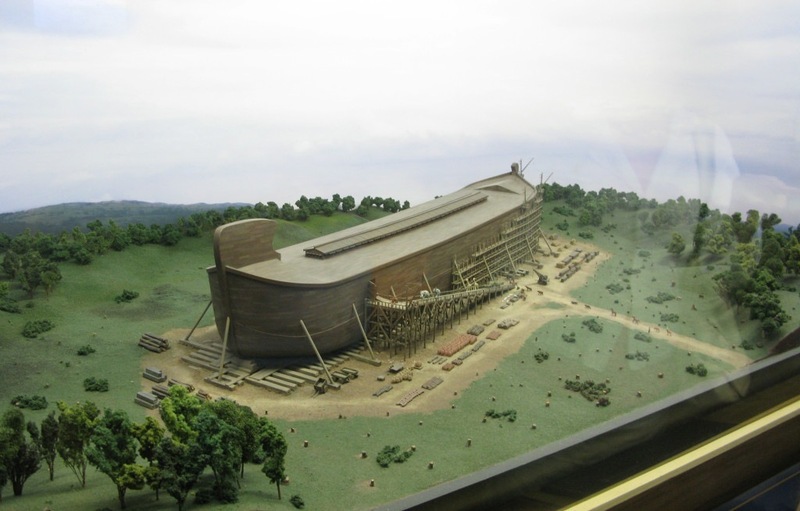 There are aÂ number of other claims as well, including that Noah only had to have one pair of dogs on board the ark which would have then evolved into all the different canids that we have today, including foxes, wolves, and domestic dogs. 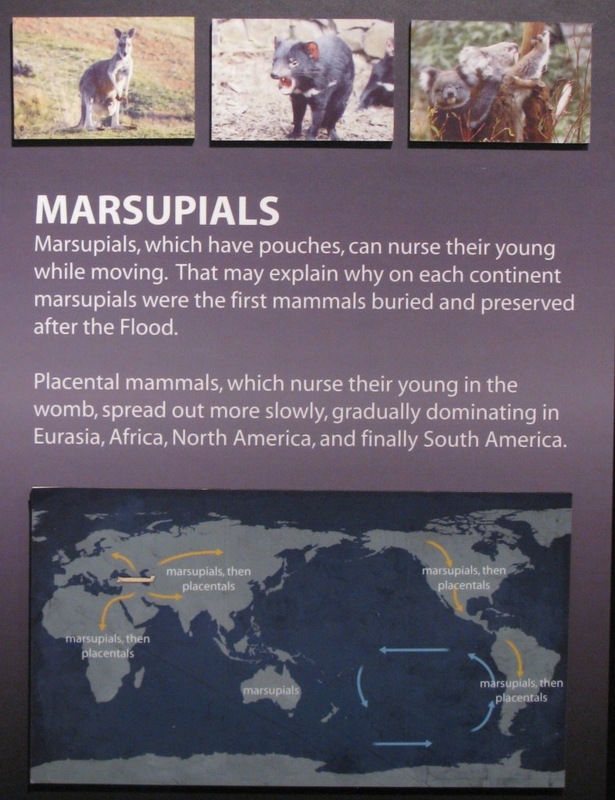 That’s a pretty big stretch for a museum that claims to refute the notion of Darwinian Evolution, especially considering that foxes and wolves are completely different species, sharing only a distant common ancestor (as do we all). One has to wonder, however, how all these different animals spread across the globe so rapidly, especially considering there were so few of them and they supposedly landed high on Mount Ararat. No worries. 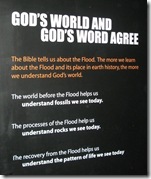 The Creation Museum folks have got that all figured out, too. 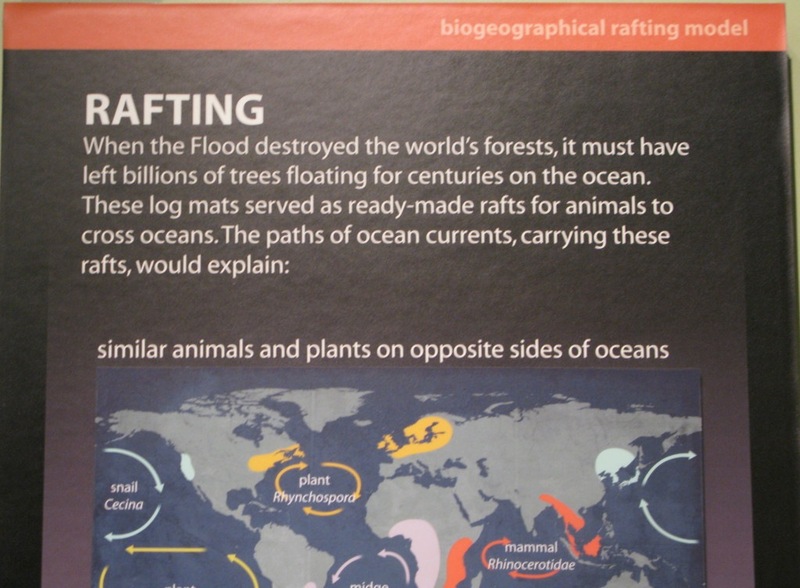 Their explanation is called “rafting.” Here’s the description. When the flood destroyed the world’s forests, it must have left billions of trees floating for centuries on the ocean. These log mats served as ready-made rafts for animals to cross oceans. 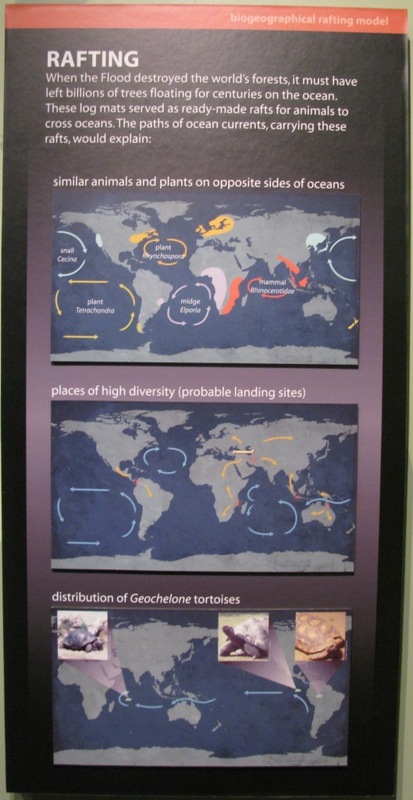 The paths of ocean currents, carrying these rafts, would explain: similar animals and plants on opposite sides of the oceans, places of high diversity (probably landing sites), and the distribution of Geochelone tortoises. I can’t make that kind of stuff up, but evidently someone has a vivid enough imagination and a low enough self-respect to offer that up as a legitimate hypothesis for the distribution of land animals. You can read it yourself by enlarging this image to the left. There’s also a mention of a post-flood ice age, ice cores, the thickening of the Earth’s crust, super volcanoes, super quakes (see! I knew Land of the Lost would factor in here!) 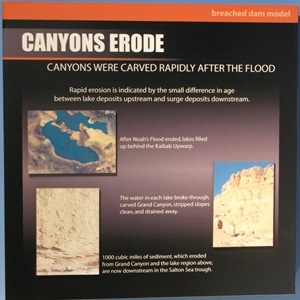 and super rapid fossilization due to all the flood-induced catastrophes. It’s worded to sound very science-like, but to anyone with a decent high school education in science, it’s pretty delusional. It explains none of these things. 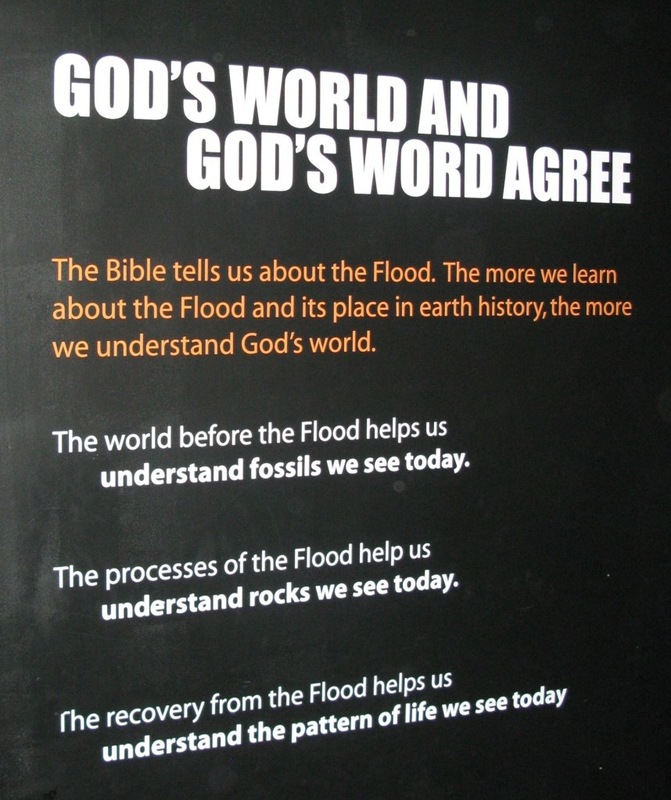 Every single one of those things is actually a stunning refutation of a biblical global flood. Everything we know about fossils, everything we know about geology, everything we know about the evolution of life… it all shows that our Earth is billions of years old. It does not show, by any rational argument, that the biblical story of Genesis is anything more than a fanciful tale written 2,000 years ago by primitive, tribal humans. The next sign, I found to be somewhat ironic. 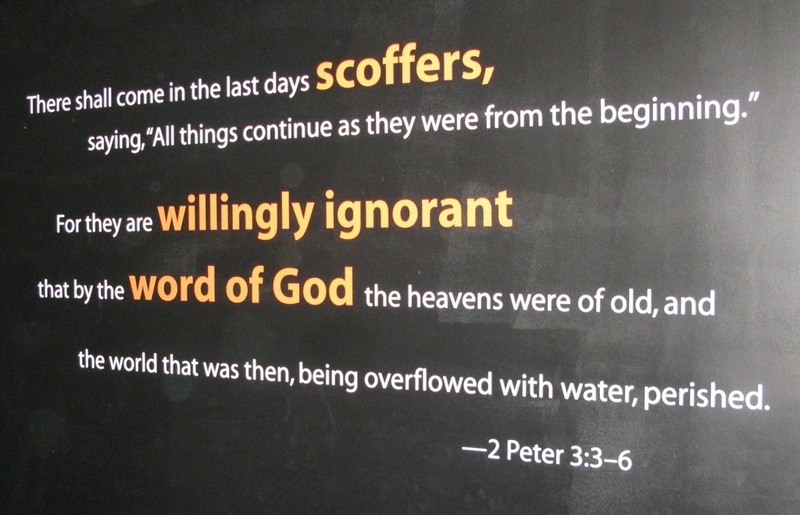 It’s a bible verse from 2 Peter claiming that, in the last days, there will be scoffers. 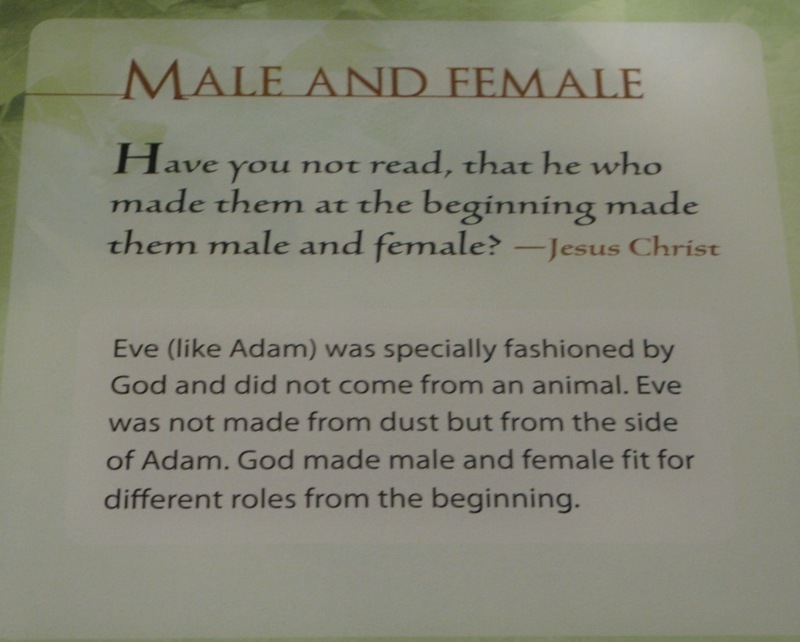 It calls them “willingly ignorant.” If ever there was a better fitting label for creationists in general, and this Creation Museum in particular, I have not heard it. 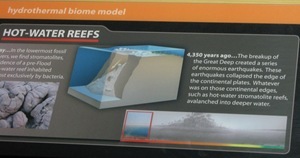 The whole museum screams of willful ignorance… from simple scientific principles to common sense history. For people who believe all this, the end of the tour probably leaves them feeling inspired and feeling as though their faith has been strengthened. For me, since I have enough science knowledge to know that it’s all bunk, it left me feeling tired… battered… assaulted… profaned… contaminated… and sad. It’s sad that so many people maintain that incredibly high level of willful ignorance. It’s sad that they let their lives be governed by ancient folklore. It’s very sad that they indoctrinate their children with the same baseless beliefs… and the same horribly detrimental misunderstanding of basic science and our world. 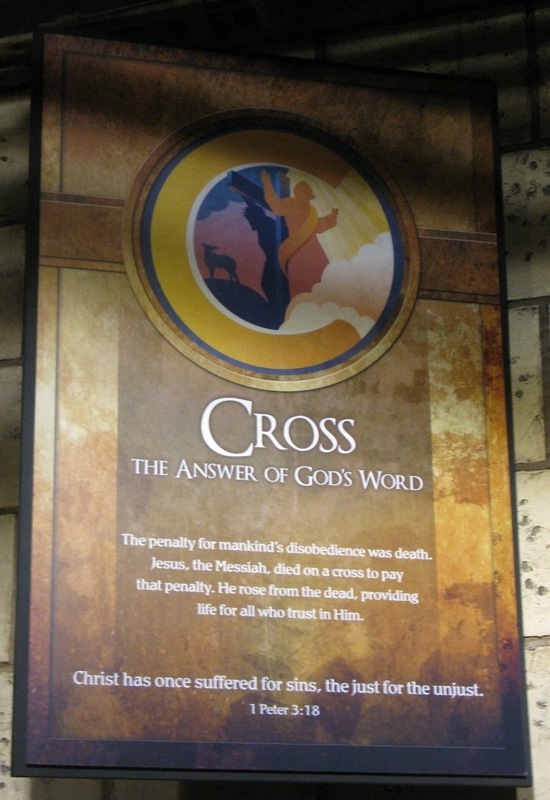 The final three “C’s” were jammed together at the end with a video titled The Last Adam… about Jesus and his death on the cross and resurrection. It was a somewhat bloody video and, like the rest of the museum videos, was of an extremely high production value. Also like the rest of the museum, it put in the information that supported its case and left out the information that didn’t. I omitted a special exhibit in an earlier post that I’ll touch on in the next post. It was titled “Natural Selection is Not Evolution” and was packed full of creationist claims that have been debunked and disproven for years and years… just more intellectual dishonesty. 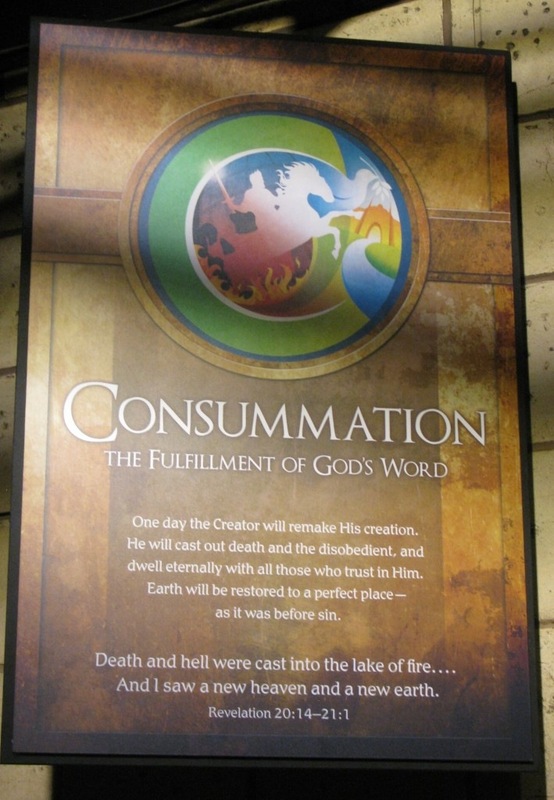 But that, it seems, is what the Creation Museum is all about. 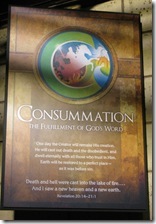 After the despair of Graffiti Alley, we headed into the Garden of Eden and the biblical creation story. 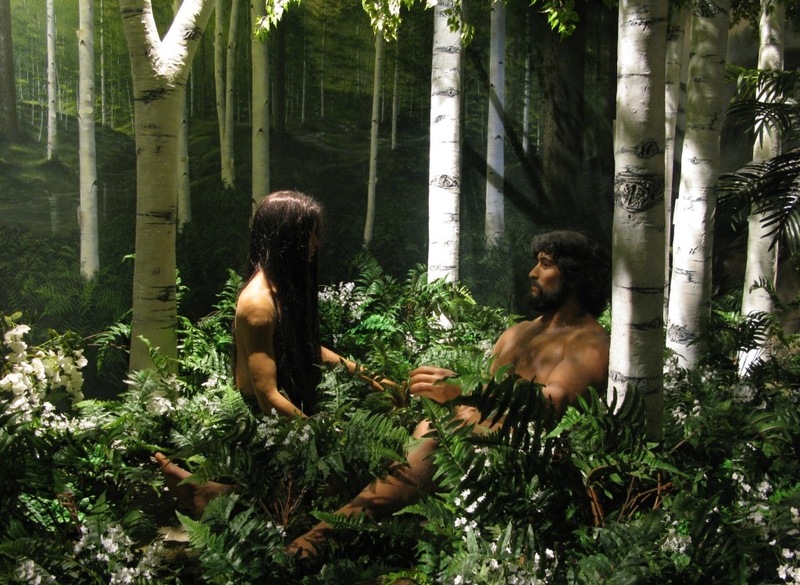 It’s worth noting here that the Garden of Eden room was absolutely incredible from a quality standpoint. Like much of the rest of the museum, the craftsmanship that went into these displays was tremendous. 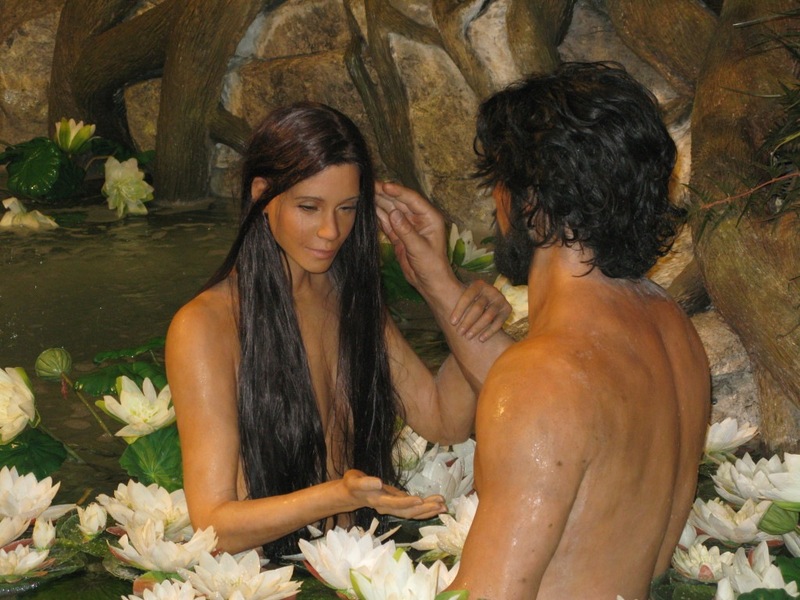 The path winds through the garden and touches upon different aspects of the creation story… Adam and Eve, Adam naming the animals, the serpent watching them bathe, etc. There are actual waterfalls, amazingly realistic plants, a “Tree of Life” that had spectacular detail, and (of course) dinosaurs. 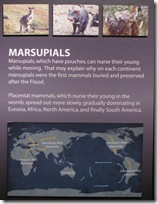 Before we get to those, however, let’s take a look at the displays and the accompanying plaques that explain them. God didn’t want Adam to be alone, evidently, because “It is not good for the man to be alone.” It seems his desire to “dwell with humans for eternity” (see Part 3) didn’t include keeping Adam company himself. He needed to do that by proxy. This is where the bible starts off with sexism, which it continues to promote with abandon in both the old and new testaments, not the least of which in 1 Timothy. 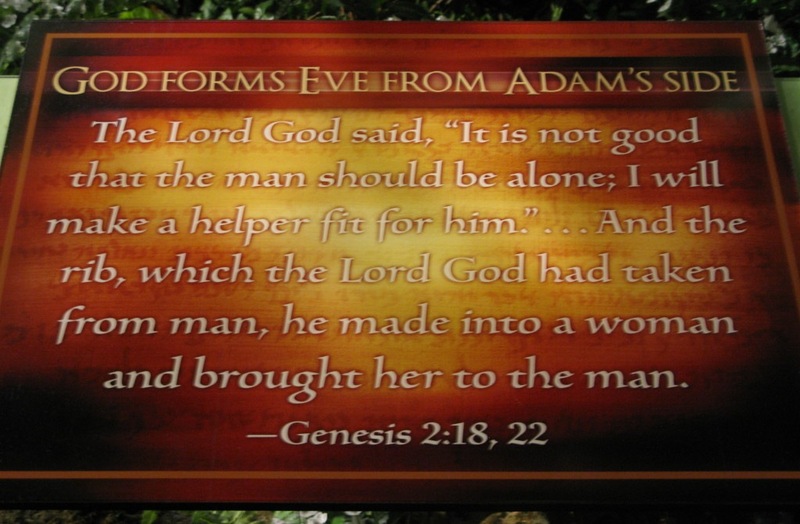 Adam was created from dust, according to Genesis, but Eve was made from one of Adam’s ribs… as a helper. 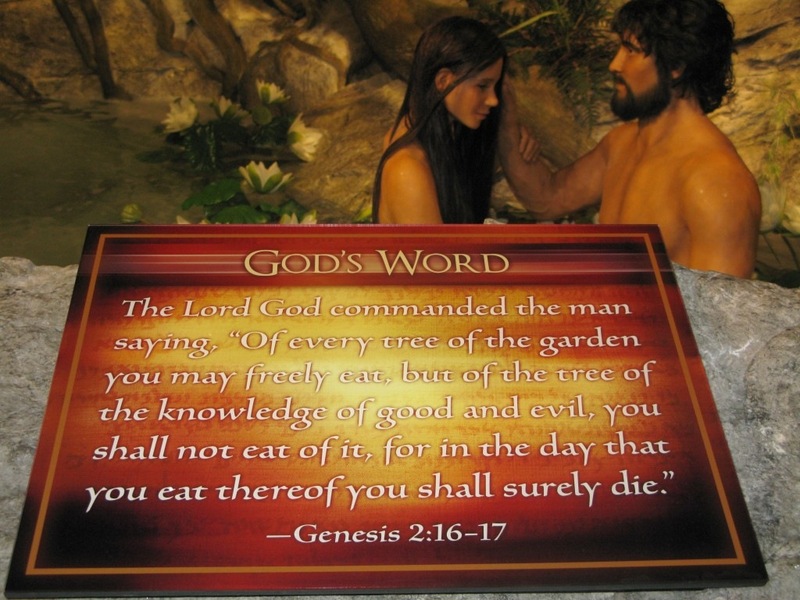 Here are the plaques pertaining to Adam and Eve at the museum. 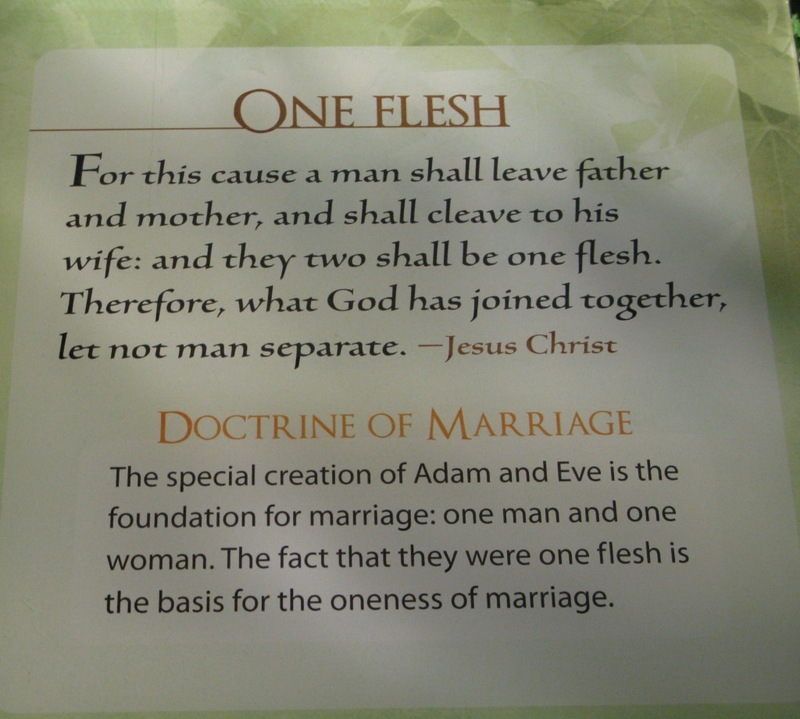 This is also where the the arguments for “traditional” marriage come from… not from any sense of logic or reason, but directly from the bible. It’s the only basis for denying marriage rights to homosexuals, which is sad. And it’s sad that this notion of using the bible as a guide to morality continues to be perpetuated in our society. To anyone who’s actually read the bible, it should seem an absurdity of the highest order. Two thousand year old dogma does not make for a genuinely enlightened society. 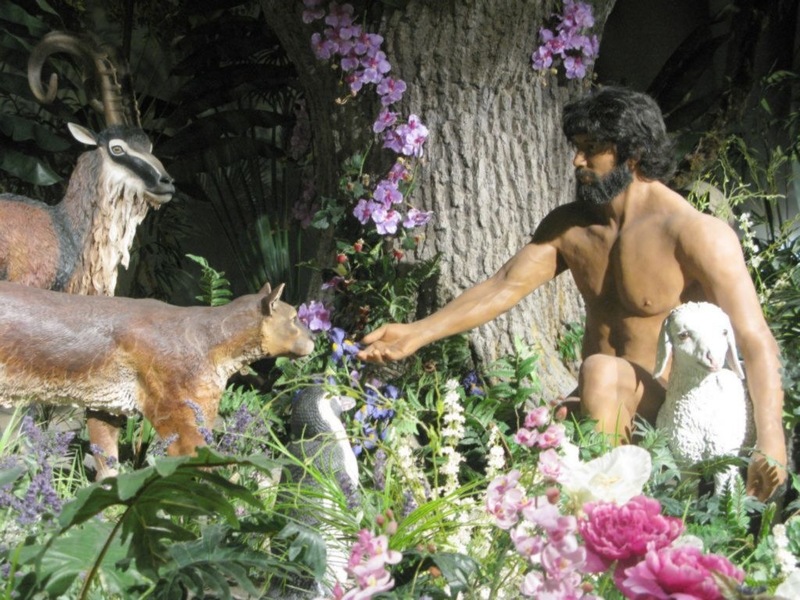 The tour continues with a scene portraying Adam naming the animals. According to one of the plaques (not pictured), Adam only named “birds, cattle, and beasts of the field – probably only animals closely associated with man […]” It seems “beasts of the earth” and “creeping things” were not included (based on the scene at the museum, however, Adam did name penguins… go figure). 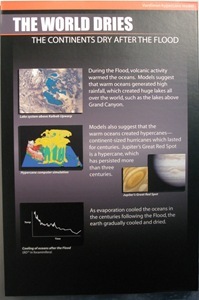 Then the plaque’s text starts in with pretending to be scientific with this statement. If the created kinds correspond to modern families, as many creation biologists believe, then Adam named fewer than two hundred animals. Naming all these animals would require only a few hours, at most. 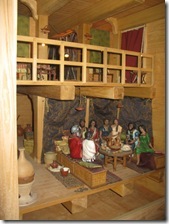 This argument of “kinds” is used throughout the “Noah’s Ark” displays as well, in an attempt to argue that all the animal “kinds” could easily have fit on the ark. I’ll get to that later, but this is where the museum first brings it up, if I recall correctly. Of course, Adam would be naming goats and sheep and other common herbivores. Perhaps he would name common carnivores as well, but that posed no danger to him, since before the Fall, all the animals, including the dinosaurs, were vegetarians. The idea that, before the Fall, there was no death, doesn’t seem to apply to plant life. Across the path from Adam naming the animals, we get our glimpse of one of the vegetarian dinosaurs in the Garden of Eden who seems to have a fondness for pineapples. 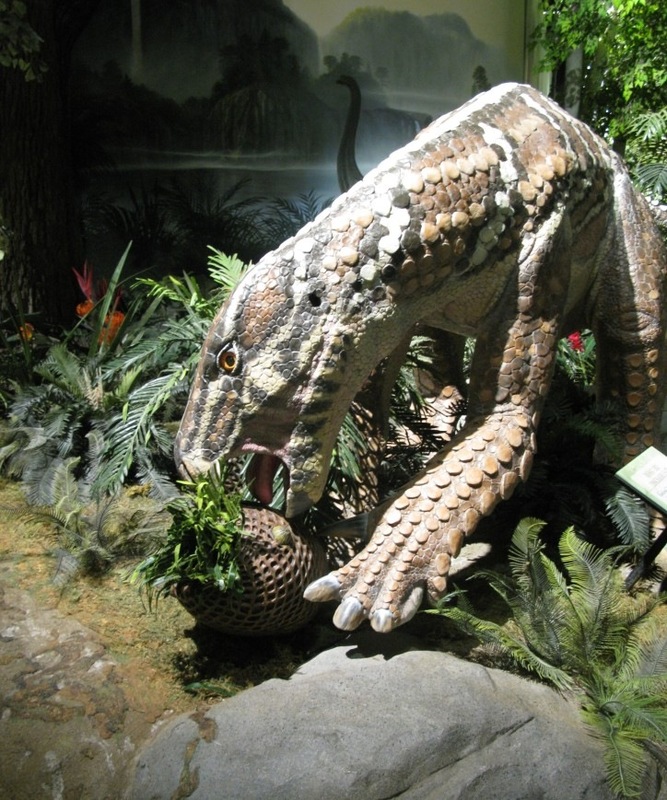 In the background, the gentle, herbivorous brachiosaurus is seen as well. 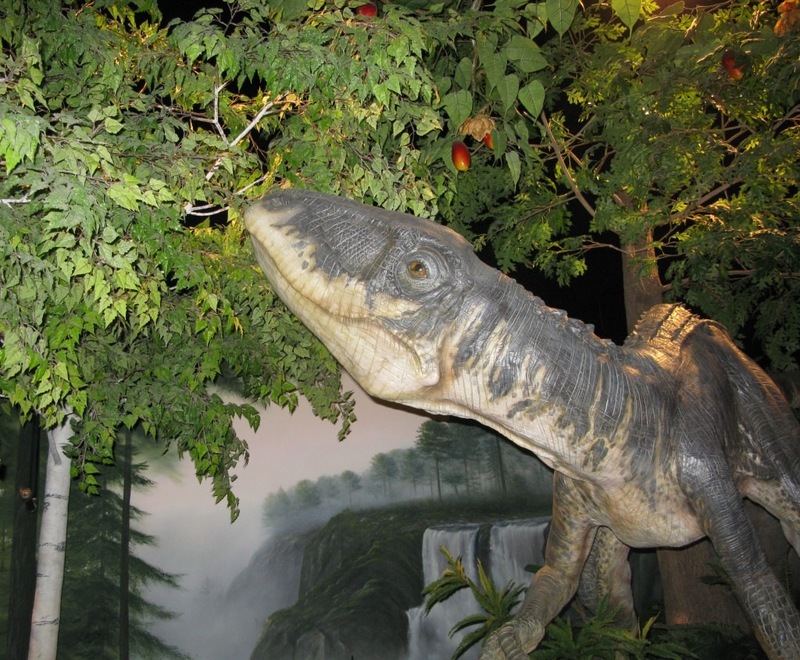 Another dinosaur in the Garden is shown to have a greater fondness for apples. 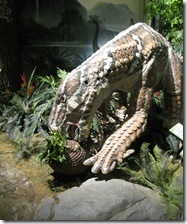 Strangely enough, there are no examples shown of tyrannosaurus rexes or velociraptors in the Garden. There are plenty of examples further along the tour that show before-and-after consequences of the Fall, such as poison, venom, scavengers, etc… but I’m getting ahead of myself. 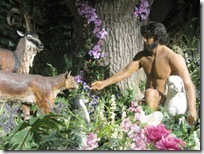 At this point, the Garden of Eden is all pure and death-free (except for plants). Here is the first hint in the display that things are about to go horribly, horribly wrong. This scene was pretty spectacular, with real waterfalls and extremely detailed rocks, trees, and plants. Adam and Eve are innocently hanging out in a pool while the decidedly sinister-looking serpent rests coiled in the tree above… plotting his evil deeds, no doubt. 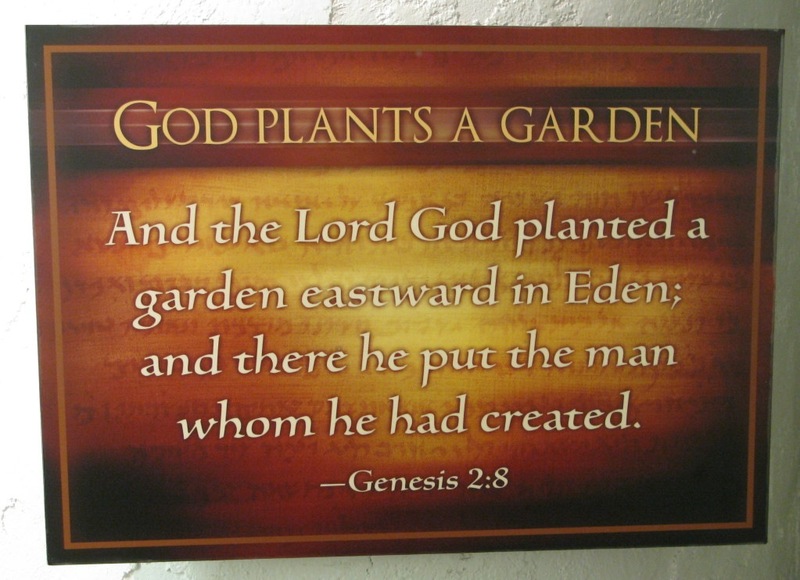 There’s no mention of how the serpent got into God’s perfect garden in the first place… or why he chose to manifest himself as a serpent instead of something more innocuous… like a vegetarian kitten or something. Here are some close-ups of the scene with the accompanying plaque. If you enlarge the photos, you can easily see the amount of work that was put into these displays to get the terrific level of detail. Regardless of whether you buy into the story or not, the displays were sincerely impressive. 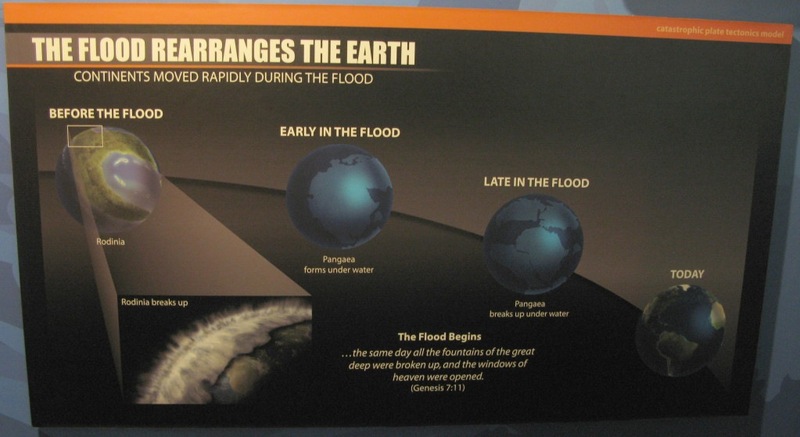 The plaque in the middle is a good example of a problem with a literal interpretation of Genesis. 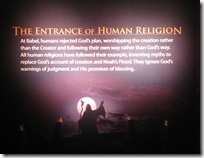 The Creation Museum (and its parent, Answers in Genesis), is very clear about its literal interpretation of the bible. Yet the verse depicted here makes the statement that, if you eat the fruit of this one tree, you will surely die… that day. But that didn’t happen. Apologists will try to say that the verse means that Adam and Eve will die “spiritually,” not physically (and some later translations removed the temporal restriction)… but that’s not what the verse says. This is a common tactic among people who claim a literal reading. It’s literal when it suits them, but metaphorical when it doesn’t. The serpent lures Eve into chomping on the knowledgey fruit (by telling her the truth, by the way), and she gets Adam to do the same (yet another biblical reason for sexism… it was all Eve’s fault)… and that’s where things go all to Hell… so to speak. God’s gloriously perfect creation (except for the deliberate setup for failure and the presence of a supposedly evil serpent) was all wrecked because Adam chose to disobey God, choosing instead to listen to his only companion in the world and eat a bit of fruit. 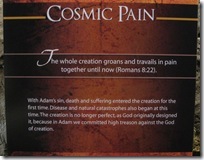 With Adam’s sin, death and suffering entered the creation for the first time. Disease and natural catastrophes also began at this time. 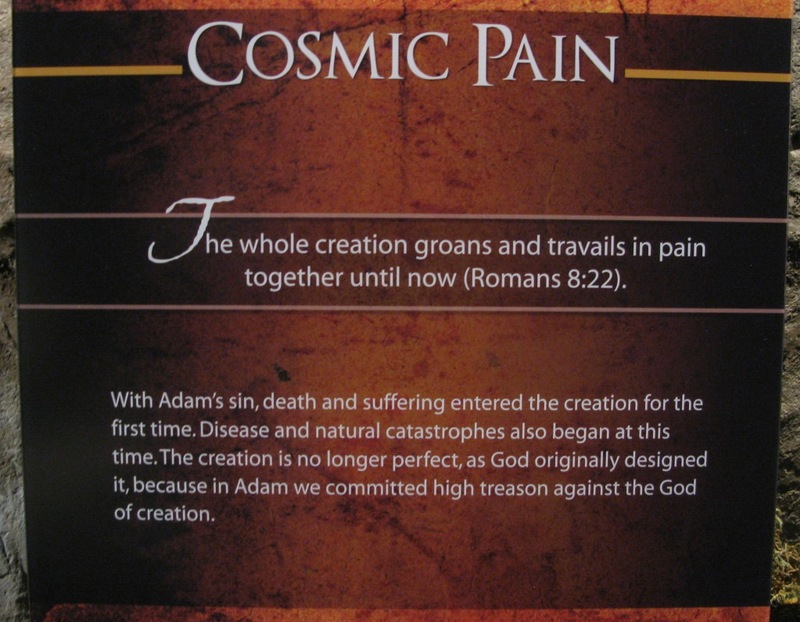 The creation is no longer perfect, as God originally designed it, because in Adam, we committed high treason against the God of creation. Whoa there! WE committed high treason? I think not. I also think that in this story, the creation was extremely far from perfect. And if this biblical god decided that, because Adam ate some fruit that he wasn’t supposed to eat, an appropriate punishment was to create disease, natural catastrophes, suffering, and all kinds of other nastiness… pretty much forever… then I think that this story is about as far as you can get from an acceptable moral teaching. It’s reprehensible. After the Fall, all kinds of “bad” things supposedly happened. 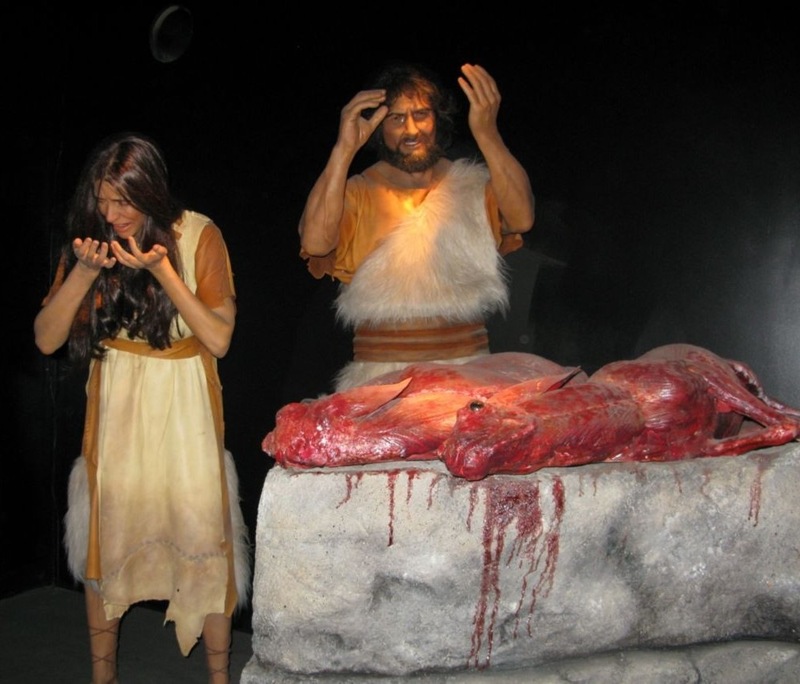 The first blood sacrifices happened (pictured below), carnivores and death appeared (pictured below… but now with velociraptors which were noticeably absent from the Garden of Eden), and (gasp!) hard work appeared! The plaque on carnivores states, “We do not know how meat eating first entered the world” but it’s possible that “the diet of some animals merely changed.” Actually, we do have a pretty good idea of how meat eating first entered the world. It’s pretty well explained by evolutionary theory. The plaque is absurd. The plaque on scavengers says pretty much the same thing, thereby descending to the same level of absurdity. The plaque on weeds is the funniest, however. 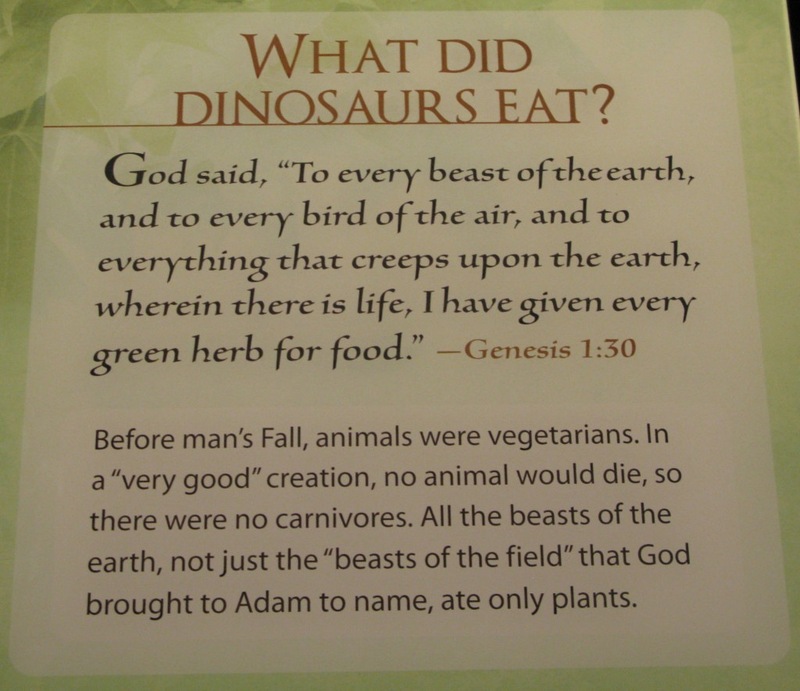 It basically says that, because God screwed up the original design, allowing things to get out of hand, he had to then step in and introduce the “overproduction of plants” to compensate for all the extra animals that would be around eating them. So plants had to “struggle against other plants for survival” (OMG natural selection!) and they grew where they weren’t wanted, hence becoming weeds. The fact that some people can actually believe this story and these explanations are factual just boggles my mind. When read as an allegory, it works just fine, much like Aesop’s Fables. But nobody seriously believes that a talking fox tried to get some grapes, failed, and then walked away, muttering that the grapes were probably sour. It’s a story. That’s all. 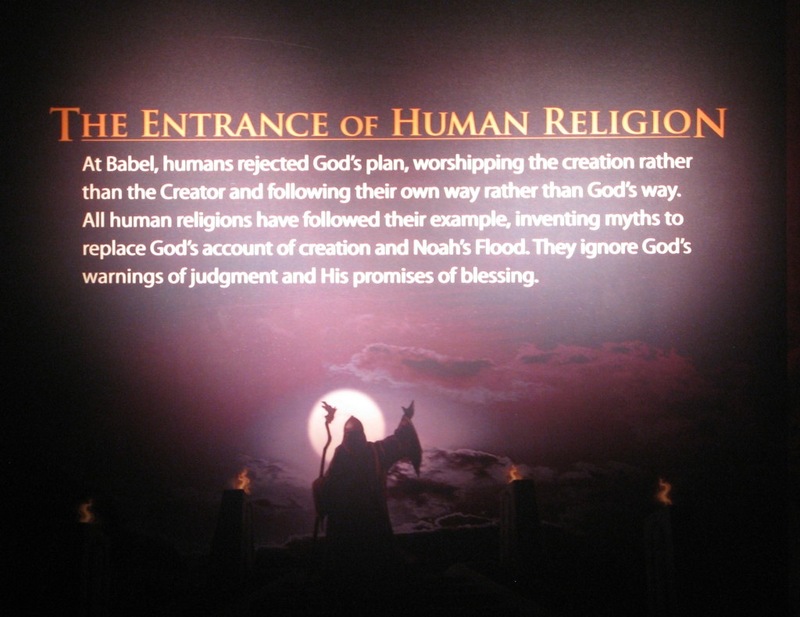 That’s what the biblical creation story is, but the Creation Museum is alarmingly deceitful in its attempt to portray the entire story as true and scientifically accurate. More worrisome is the fact that many people agree with the museum’s viewpoint… and those people are indoctrinating their children to believe the same anti-intellectual nonsense that they themselves believe. It’s a recipe for societal disaster. When ignorance is promulgated as a virtue, as it is within the walls of this museum, civilization is harmed in an insidious way. When we stop seeking answers about our world, instead relying solely on ancient religious dogma, we take a grand step backward on the evolutionary ladder. …and that is a bigger fall than the biblical authors could ever have imagined. Ricky Gervais: Darwin was wrong. Since I haven’t been posting much lately, I thought I’d toss in a little bit of humor courtesy of Ricky Gervais. I just caught this on Unreasonable Faith and wanted to share because everyone can use some laughter to brighten up their day. As I’m sure you are aware, some Christians interpret the bible mostly as a fictional story filled with allegories and examples showing how we should live our lives. Some other Christians seem to not “interpret” the bible at all, instead taking it at its literal word, insisting that everything is true in exactly the way it is written. I usually don’t have much of a problem with the first group, much like I don’t usually have a problem with those who interpret Aesop’s Fables as fun made-up stories with accompanying moral lessons. If Aesop-readers started speaking as if real talking foxes were actually disgruntled over not being able to eat grapes, there would be a different issue. The bible literalists are the ones I target in this post. I find that, right at the beginning of the bible, we see that God is either not all-knowing or he is a liar. There are a number of biblical passages that show this, but I’m going to start right in Genesis chapter two. God tells Adam that he can eat from any tree in the Garden of Eden except… the Tree of Knowledge. So far, so good. Other than setting Adam up for failure (and already knowing that Adam will fail, being all-knowing and whatnot), this is a relatively straightforward rule. Here’s the exact quote from the King James Bible. That’s pretty simple. Eat from any tree in the garden whenever you want, just don’t eat from the tree of knowledge because on the day you do that, you’ll die. Wait… you’ll die? That day? If you continue reading Genesis, you’ll see that Adam and Eve both lived long after they chomped on the forbidden fruit. Strangely enough, that’s what the serpent told them. 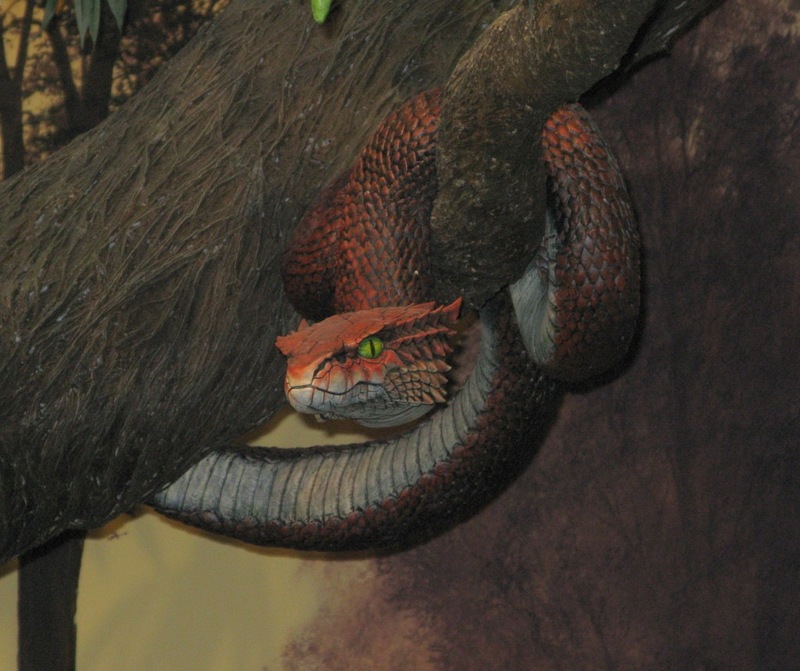 So did God lie and the serpent tell the truth? …or did God make a mistake when he just thought that Adam and Eve would die that day. 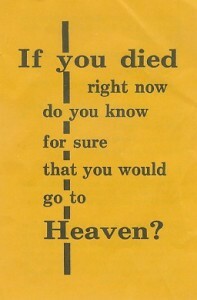 It’s got to be one or the other because according to the bible, they most certainly did not die that day. Every now and then, I find a religious tract lying around… a movie theater, a restaurant, the top of a urinal at an all-inclusive resort in the Mexican Riviera (seriously). I always pick them up because they usually provide a fair amount of amusement. Chick Tracts are the most amusing with their over-the-top cartoons, but I rarely come across them “in the wild.” More often than not, I find ones similar to the one pictured here (you can view the full tract by clicking on the image). They’re not as exciting as the Chick ones, but tend to be entertaining, anyway. I do find it interesting to note that I’ve never received one directly from another person. I only ever find them lying around. I assume it’s because that, for most people, it would be a little uncomfortable to walk up to a perfect stranger and hand them a tract, opening an opportunity for dialogue, but also for ridicule or rejection. I used to work in commission sales, so I know that feeling and can sympathize with the tract carrier in that regard. 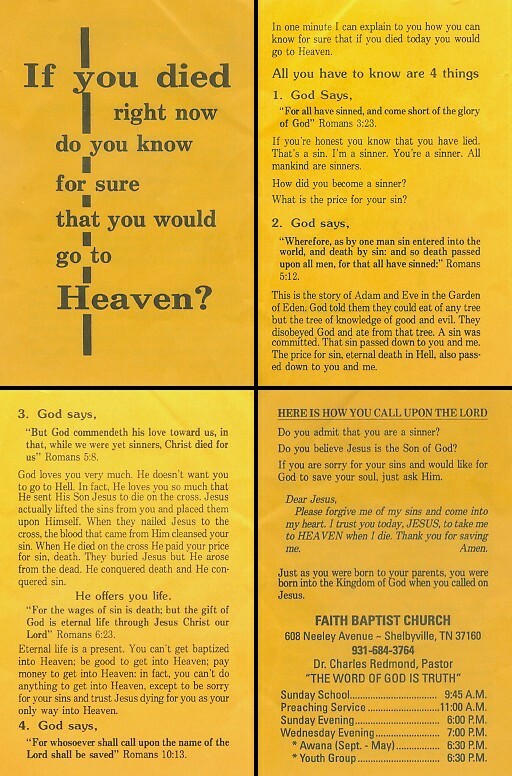 I am, however, always disappointed when I don’t get the opportunity to discuss the tract. I’m not a hostile or angry person, and if I had time available when given a tract, I’d happily take some time to talk to the giver to find out about their beliefs and why they believe them. Since I didn’t have that opportunity at the all-inclusive resort in Mexico, I’m going to talk about the tract here. It won’t be quite as fun as talking to the original carrier, but I’ll take what I can get. Though science can cause problems, it is not by ignorance that we will solve them.